Event handlers enable you to create a condition which, when met, triggers notifications to concerned parties such as DBAs, System Administrators and so on. Assets and Groups: enables you to select multiple assets or multiple groups to monitor. It is possible to define both Assets and Groups in an event handler, but is not recommended. It is recommended that you create the event handler using either Assets or Groups, not both. If you define Assets and Groups in an event handler, notifications are only sent for the defined Assets which also exist in the defined Groups. Advisors: enables you to select multiple Advisors to evaluate. Event Statuses: enables you to select multiple statuses to monitor. 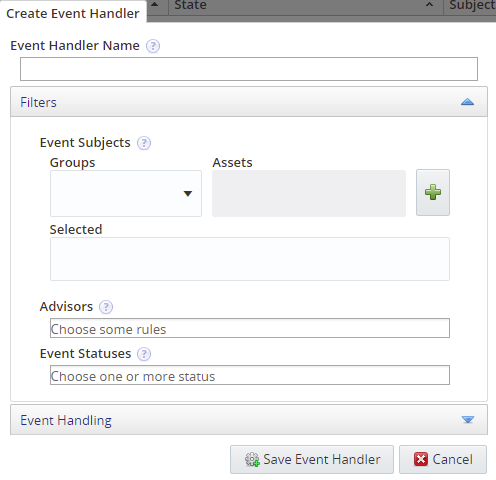 To create an event handler, click Create Event Handler in the Event Handlers section on the Event Handlers page. The Create Event Handler dialog is displayed. Specify a name which uniquely identifies the new event handler. Select the groups of assets to monitor. If this field is left blank, all groups are included in the event handler's condition, unless one or more assets are defined. If assets are defined, and the group field is blank, the event handler's condition includes the selected assets only. Select the individual assets to monitor from the Assets drop-down list. If this field is left blank, all assets are included in the event handler's condition, unless one or more groups are defined. If groups are defined, and the asset field is blank, the event handler's condition includes the contents of the selected groups, only. The Assets drop-down list displays the Assets in their groups, if groups are defined. If no groups are defined, it lists the assets. It is not possible to select groups in the Assets field. You must expand the group to select individual assets. If you select the top-level of the asset, all assets are selected. This includes network interfaces, file systems, MySQL instances, and so on. You must expand the asset's entry to select individual assets. Select the groups of assets to monitor. If this field is left blank, all groups are included in the event handler's condition, unless one or more assets are defined. If assets are defined, and the group field is blank, the event handler's condition includes assets only. Select the Advisors. If this field is left blank, all advisors are included in the event handler's condition. Select the statuses for which you want to receive notifications. Select the groups you want to notify. Notify on event escalation: sends a notification only if the event changes to a higher priority. From Warning to Critical, for example. No notification is sent if the event changes to a lower priority. From Critical to Warning, for example. Notify on any status change: sends a notification if the status changes to any other status. Always notify: sends a notification every time the defined event status(es) are broken. For example, if Critical and Emergency are defined in the Event Status field, and Always notify is selected, a notification is sent every time the Critical and Emergency events are triggered for the selected Advisors. Defines the maximum number of SMTP notifications which can be sent per minute. The default is 10. Defines whether SNMP Traps are used for notifications. Yes: the default auto-close policy is honored and the events are closed when the conditions defined are no longer met. No: the default auto-close policy is ignored and the events remain open in the Events page even after the conditions are no longer met. If you leave the Assets, Groups, and Advisors fields empty, the event handler can generate an extremely high volume of emails, depending on the number of assets monitored. It is recommended to create event handlers which address specific requirements and contain strictly defined criteria. Do not define both Assets and Groups, use one or the other. If multiple event handlers are defined on the same advisor, their corresponding actions are combined into a single action. However, these actions are logged separately in the event handler log.